Mascot’s GRC is a composite of concrete and fiberglass technologies. It has the benefits of both products: the solidity of concrete and the high instantaneous strength of resin fibreglass. The design and manufacture of products from GRC is covered by a set of international standards and comes from over 30 years development. Currently GRC is manufactured in over 100 countries… its worldwide acceptance as a building material has also born a number of manufacturing methods. 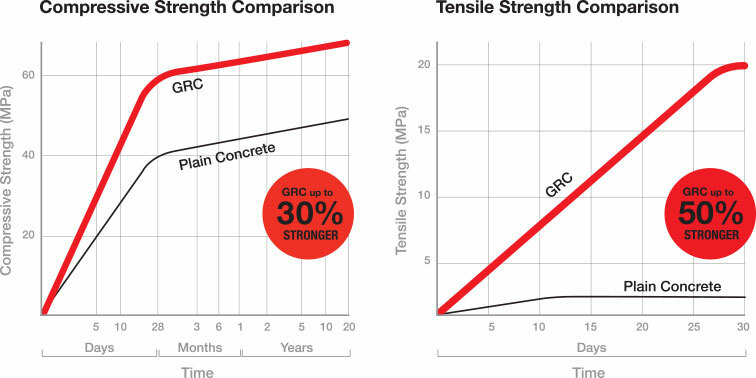 If concrete remains un-reinforced, it is strong in compression but weak in tension. Precast concrete is traditionally reinforced with steel; however these precast concrete products are not only corrosive but extremely heavy due to their overall thickness. Mascot Engineering started working with Glass Reinforced Concrete (GRC) in the early 1980s, one of the first in Australia. Originally using the more traditional ‘spray-up’ method, we began developing wetcast GRC – today we are the largest manufacturer of Glass Reinforced Concrete products in the Southern Hemisphere. As the fibreglass is through the entire product (not just reinforcing in some parts), we’re able to achieve the strength of traditional steel reinforced concrete with a thinner section. This means that we can significantly reduce the weight of finished products – in some cases up to 1/10th the weight of a comparative product. All Mascot Engineering GRC products have a minimum fibreglass content of 3% – this is to relevant industry standards and engineered for purpose. Most components are designed to be lifted by one or two people so you don’t need to tie up your backhoe, excavator or crane (and operator) for hours just to move product around on site and install. GRC’s absence of steel reinforcement makes it ideal for usage under normally corrosive conditions and is resistant to chemical attack. Mascot GRC: Did you know?